Biblical Men Wanted Now – The world needs men of God who know what their Bibles say and will act upon it. We will need strong, biblical, male leadership in the coming days more than ever. This DVD is a great tool to guide Biblical men into that practice. We cover lots of verses and stories that demonstrate how men of the Lord should be living their lives. Biblical ladies, this DVD is great for you, too, because it shows how men of God should be living and it will encourage you to always seek that biblical man as a husband. What If You Were At Virginia Tech? 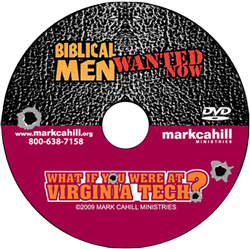 – The second talk on this DVD is “What If You Were at Virginia Tech?” Ask yourself, if a gunman walked into your church, school, business, or home, as a Christian, how would you respond? I asked that question during a college chapel service and got some very interesting answers! As this talk unfolds, we go through many verses and stories that show how men and women of God could handle such situations. They do not need to fear man or death, but only the God who created us. This DVD is challenging and helpful, and you may want to pick up some extra copies to put into the hands of more men and women of God in the coming days.